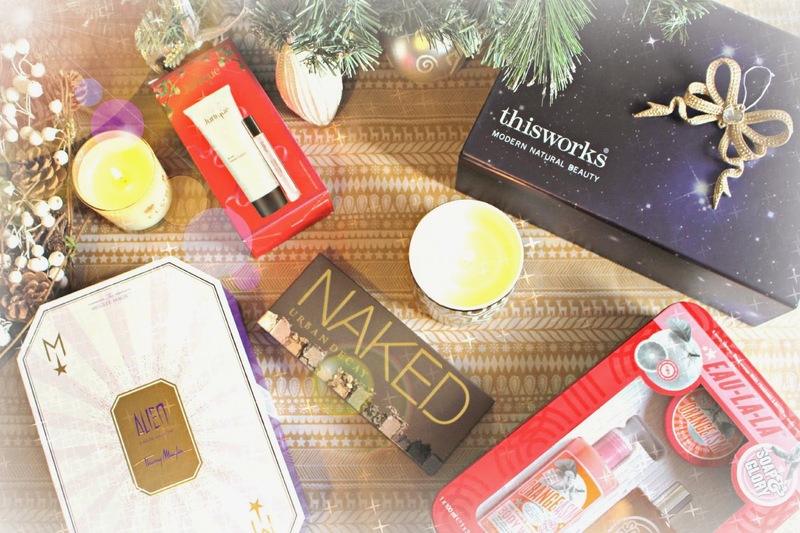 My Favourite Christmas Gift Sets! It’s universally known that gift sets make the perfect present. A selection of matching products so that you can gift your loved ones a total pampering experience! Whether you choose to splash out and treat someone to a luxury set from thisworks, or choose one of the infamous Soap & Glory gift sets, i’ve chosen my favourite selection so perhaps i’ll inspire you to spoil someone special! OK, so not strictly a gift set, but the original Naked palette from Urban Decay makes the ultimate Christmas gift – it’s a classic palette which revolutionised neutrals – containing 12 bronze hued shadows in all the shimmers a girl could need, matte, satin, shimmering and sparkly. It’s a year-round favourite but one that you may not choose to splash out on for yourself, making it a perfect gift to unwrap on Christmas day! £37.00 from Selfridges here. Since trying out the Jurlique Face Mists (review here!) I’ve been keen to try more products from the brand. Rose is a universally loved fragrance so the Aromatic Rose Duo containing the Rose Hand Cream and Essence of Rose is a safe bet when it comes to pleasing the lucky recipient at Christmas! It’s £35 from the Jurlique website here. Soap and Glory gift sets are always legendary and such great value. I’ve never met a girl who doesn’t love pampering herself so the Eau La La set is another fail-safe option. The products all have a zesty scent; including the ORANGEASM Body Butter and Body Wash, plus the Super Tonic Fragrance Spray. At £16.00, I think I might stock up for the next few Christmasses! You can buy from Boots.com here. Thierry Mugler‘s fragrance gift boxes are definitely my number one choice for perfume sets this festive season, with two fabulous offerings, Angel and Alien, the only tricky decision is which one to try! Firstly, the Alien Set contains one of my favourite fragrances ever! Yep, you guessed it – The Alien Eau De Parfum in 30ml is paired with a 100ml body lotion, 30ml shower cream and a mini 15ml pot of body cream. The fragrance is comforting and sensual, with floral and woody notes – a classic scent. It’s £39.50, available from The Perfume Shop here. Slightly more pricey is the Angel set, currently on sale for £72.50 (down from £85.00) on House of Fraser here, the set includes a 50ml bottle of the refillable Eau De Parfum, 100ml of the perfumed body lotion and also 100ml of the marching shower gel. It may be a little tragic but I also love the box itself and I can’t wait to store some beauty favourites in it afterwards! I think I saved the best til last! The ultimate gift for your hard-working pals who just need some ‘me-time’, and the best me-time of course is a good night’s sleep! I don’t think there’s a better gift than that! The thisworks I have a dream gift set contains all the essentials for a peaceful night’s sleep, with their signature blend of Lavendar, Vetivert and Camomile essential oils. Within the set is the classic favourite; the deep sleep pillow spray, as well as a deep sleep night oil, dream cream and also a deep sleep candle. With the same fragrance across the range, you can use all together, or just choose the products that you fancy each evening. At £75.00 (from thisworks website), it’s one to splash out on, but the recipient will love the thoughtfulness of the gift and ultimately enjoy indulging themselves in a restful slumber. I hope I’ve inspired you to choose something fabulous for a special person this Christmas, or maybe even just splurge out for yourself – these gift sets will be pretty hard to part with! Next Post Christmas Jumper Day OOTD!